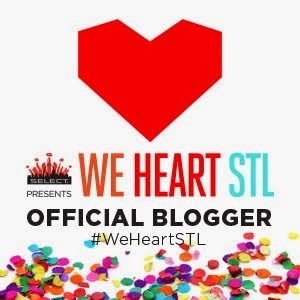 If you've been on pins and needles waiting for another fashion event to hit St. Louis, you can exhale. 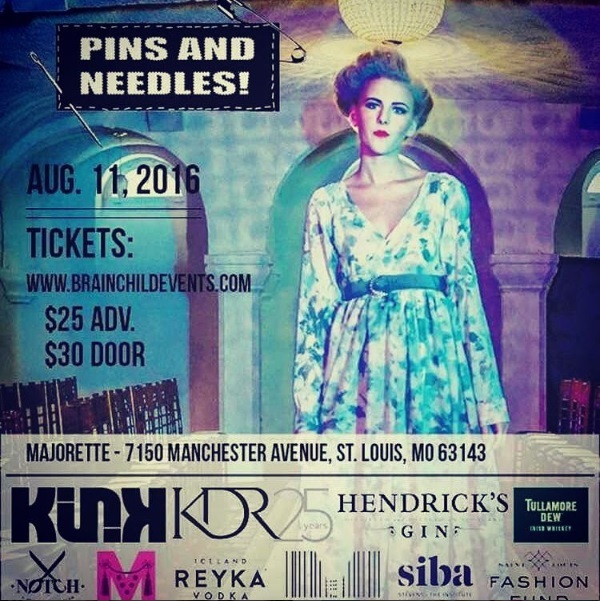 The 8th annual Pins and Needles Design Competition hosted by Brainchild Events is coming up on August 11, 2016. It will take place at the brand-spanking-new venue called the Majorette. This year's crop of designers includes the aptly dubbed the Emerging 6: Andrew Clancy (Nashville, TN), Marcel Coleman, Jr. (St. Louis, MO), Richard Cotto (St. Louis, MO), Laila Fattal (Brooklyn, NY), Morgan Mason (St. Louis, MO), and Wiki Wang (St. Louis, MO). One artist will take home a $15,000 prize package to help launch his or her career. I was fortunate to get the backstory on one of the artists, Marcel Coleman, Jr. His road to the competition took a shocking, awful turn, but no doubt helped him create even more incredible work. Read on. . .
All designers have a story to tell, but for some, telling that story becomes a life purpose. Marcel believes that sharing his testimony is not only important for his own growth, but for the others seeking a place in the fashion industry. As an African American male and a designer, Marcel is saddened by a lack of representation in the fashion industry. "I feel that a lot of inspiration in fashion and the arts is sampled from minorities, but the industry as a whole has a hard time showcasing those minorities," he explained. "My goal is to find opportunities for us to give the world what they need to see." Broadening the scope of who is celebrated in design, he believes, will "enhance the beauty of fashion as a whole." Marcel's fashion story had its critical chapters at Columbia College-Chicago, where he graduated with a degree in Fashion Design. He became adept at creating and dying his own textiles. This helps him do what he values most as a designer: challenge minds and perspectives. Through playing with color, textiles, and silhouettes, Marcel creates innovative designs that stretch the boundaries of menswear and womenswear aesthetics. For the Pins and Needles Competition, he put together a collection to represent a new chapter in his life. "I'm reliving my youth, the good and bad, and showing power in my pain," he shared. "I'm using the representation of bricks, how they are created by hand and stacked amongst each other to hold things up or block things from getting in." 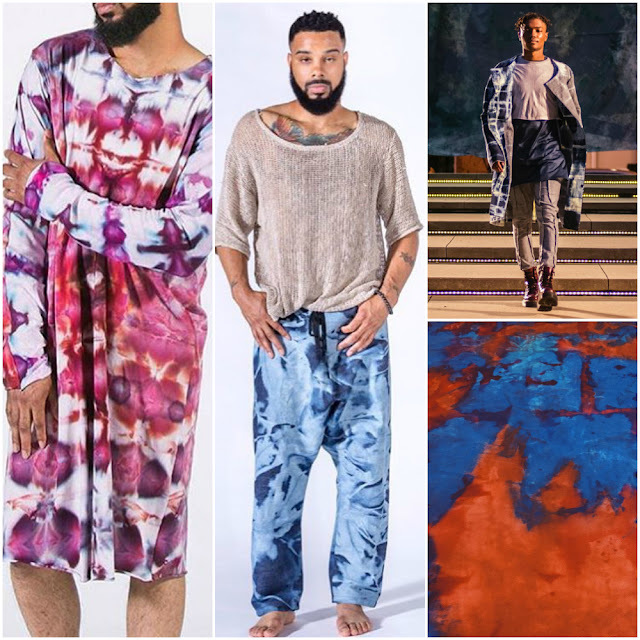 His garments will include hand-dyed fabric, folding methods, patchwork, and raw edges. "It's my first big collection," he said with pride. "A lot of love, tears, and time are soaked into each print and every stitch." Devastating news, however, made Marcel consider resigning from the competition. Just when he was working out details for the event such as models, he received the call that his father had passed away. Part of him no longer cared about designing - or anything - but his faith urged him to continue his art. Marcel believes that "we're given challenges not to stop us, but to build us." He incorporated a pink flower print into the collection as a special tribute to his father. For Marcel, being part of the Pins and Needles competition is "an opportunity to help not only myself, but other people pushing through life situations and making it count for something beautiful." Wear: Pull out all the stops! I can't wait! Now, if I could only figure out what to wear.